This early American mill in the center of Sandwich is at the end of a lovely mill pond (Shawme Pond) complete with ducks, and next to a cool, splashing mill race and an old pump. Dexter Grist Mill, at the intersection of Main and Water streets in Sandwich (map), was built in 1654, fully restored in 1961, and got a new, larger waterwheel in 2015. The mill is not just a picturesque landscape attraction. It's still a working mill! You can go in and see the wooden mill mechanism at work grinding corn (maize), and you can buy bags of fresh cornmeal the same day it's ground. 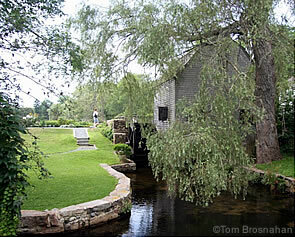 Thomas Dexter built the first grist mill on this site in 1654 so that the inhabitants of the village of Sandwich would not have to grind their own corn for cornmeal, their staple food. Today you can buy cornmeal ground in the mill, along with recipes for dishes similar to those the early inhabitants of Sandwich might have made daily. The mill is open from mid-May through early September, daily from 10 am to 5 pm. An admission fee is charged to enter the mill. From the mill, the famous Sandwich Glass Museum is right across the street. Just a few minutes' walk from the mill along Water Street takes you to the Thornton W Burgess Museum, and Hoxie House, another historic landmark from the 1600s.